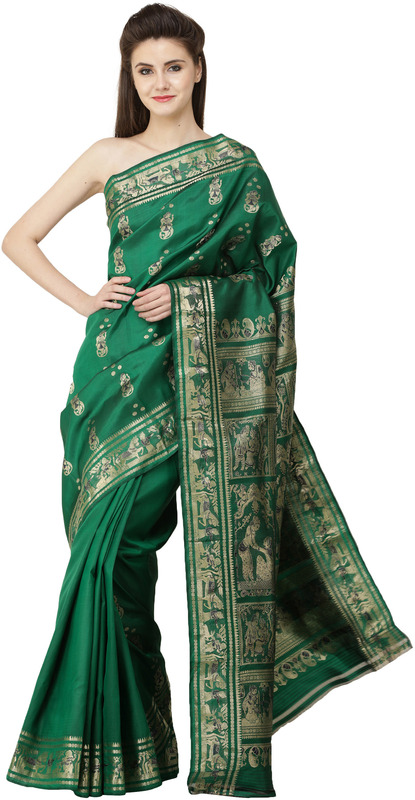 A romantic saree in every way, this Baluchari would be a one-of-a-kind addition to your wardrobe. For these figured silks that are designed to go into the Indian bridal trousseau, this earthy green shade is an unusual colour. The gold of the zariwork that graces the field, border, and endpiece add to its distinctly feminine charm. Baluchari sarees are famous as storytelling sarees from Bengal - zoom in on the zari-embroidered panels to make out the figures of Shakuntala-Dushyanta and Radha-Krishna, the age-old lovers of Indian folkore. The superb precision of the embroidery and the lifelike appeal of the figures portrayed would stun all who set eyes on you in this saree. The endemic Bengali drawloom is the only one in the subcontinent to have the requisite mechanism for the multi-weft and multi-warp weave characteristic of figured silks, which explains the price and exquisteness of these sarees. Having traditionally been worn by the regional brides during their all-important wedding rituals and on the gorgeous autumnal Durgapuja festival, this relatively simple number stands out from the rest of the Balucharies in our collection. It is because of the prominence of the foundation green, what with the zariwork spaced out across the field. Teamed with your statement gold hand-me-downs, this is the perfect saree to wear on those post-wedding trips to the in-laws'.